My very first shawl. It was oversized and took me a week of working in between kids and life! I used Bernat Satin yarn in a gorgeous Color called Olive Oil. 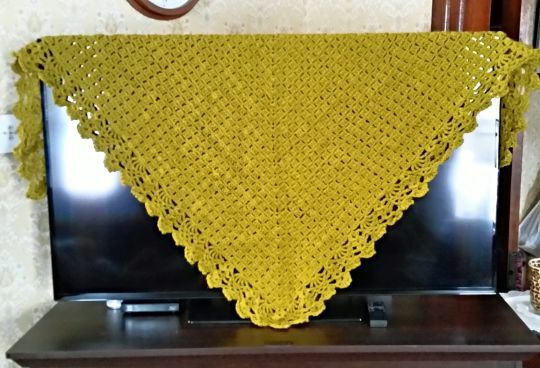 This shawl is soft and warm and has a beautiful sheen. Loved this yarn! Body of shawl is from Doris Yocum Turner of Ideal Delusions. Border is from the “All Shawl” pattern by Doris Chan, found as a free download on Ravelry! Sorry, I forgot to give kudos for the pattern, I’ll fix that immediately! It’s actually two patterns, one for the shawl and then one for the border, both are free. At first the way she was explaining to do the border was a little confusing, but as you can see I figured it out! I’ll give you the links to the patterns and if you need any help, just let me know. Thanks for liking my work! I forgot to list where I got the patterns for this shawl. The links are in the previous comment. Body of shawl is from Doris Yocum Turner of Ideal Delusions. Border is from the “All Shawl” pattern by Doris Chan, found as a free download on Ravelry! Enjoy!